Discover the spirit of the town of Mykonos with a walk through the labyrinth of alleyways, lined with traditional white houses that stand out against the dark blue sea and go as far as Little Venice and the famous windmills. A town that offers breathtaking views. Mykonos was once a peaceful fishing village, bit it has now become the most famous town of all the Greek islands and a splendid resort which attracts not only tourists, but also film stars, artists and the jet-set celebrities. Our tour guide will take us into the heart of the town to discover the authentic spirit and atmosphere if the narrow alleyways, where the white houses strike a sharp contrast against the bright colours of the bougainvilleas and geraniums. If you feel lost in this labyrinth of little streets, there is a reason: the town was designed in this way to confound invaders and thwart pirate attacks. Every corner of the town is worth photographing: the painted doors, the numerous chapels, the balconies bursting with flowers and the white pavements, which make the town unique in Greece. 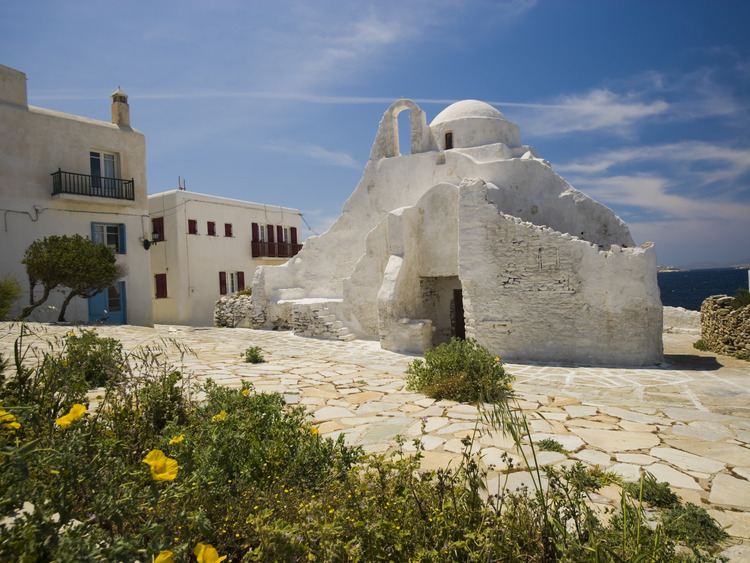 The architecture is typical of the Cyclades as seen on all the postcards of the Greek islands. We must not miss a visit to Little Venice, a distinctive district in the town, where the houses are built on the water's edge. It is said these buildings were used to quickly load and unload ships to avoid pirate attacks. Today, we can dine in one of the numerous restaurants lining the seafront: a unique and emotional sight! Our walk continues toward the promontory south-west of Little Venice to admire the famous windmills, a symbol of the island of Mykonos, once a major trading centre between Venice and Asia. Dating back to the 16th century and situated near the old port in a strategic position to exploit the wind, the windmills were used to mill wheat. From here we can catch some beautiful glimpses of the panorama and we can stop to take some photos. We proceed towards the area of the castle and admire the famous church of Paraportiani, one of the most famous architectural buildings in Greece. It was begun in the late 15th century and was part of a group of five minor churches completed in the mid 17th century. The first four churches were merged and the fifth church was built on top of them, creating the roof with a central dome that we see today. The last leg of our tour is Manto Square, where the statue of Manto Mavrogenous stands, a hero of the Greek War of Independence. We do not have to bid farewell to the town just yet, as we still have a little time to explore its hidden corners and do a bit of shopping or relax, sip a drink and enjoy the view from the terrace of one of the bars.